Nicotine salts are gaining public success through the effect they produce in e-liquids in which they are incorporated. However, we find under the name "nicotine salts" very different realities. This development deals only with the three most common nicotine salts (benzoate, levulinate and lactate), but the problem remains the same for the other nicotine salts on the market (citrate, pyruvate, malate, succinate), more rarely used. A salt is obtained by combining an acid and a base by ionic bonding. To put it simply, an ionic bond looks like the attraction of two magnets towards each other. The resulting crystals are generally soluble in water, sensitive to pH and electronegativity (since their association is of the electrostatic type). The liquid thus obtained passes, firstly, a resistance where it undergoes an electrostatic influence, then the oral environment whose pH is alkaline. There are mineral salts that combine metals and minerals, such as table salt and organic salts that combine carbon and oxygen molecules, as in this case. Nicotine benzoate: 57,05% nicotine and 42,95% benzoic acid. Nicotine salicylate: 54,02% nicotine and 46,01% salicylic acid. It is in this form of crystal, whose purity must be systematically controlled, and of which we have a pure witness in the laboratory, that the product is sold to manufacturers. A well controlled process results in crystals with a purity higher than 99,8%, whereas an approximate reaction mechanism leads to the presence of free acid or nicotine which makes the finished product potentially dangerous. The next intermediate dilutes the crystals in a PG / VG mixture and resells them to the formulators. After analysis, it is found in the laboratory that less than 20% of the samples analyzed comply with the indications in the data sheets and labeling. In the best case, the concentrations are lower than announced, at worst they are totally fanciful so that the formulator does not know the nicotine content of the finished product that it offers to consumers before placing on the market. which can pose a real problem of labeling. It should be noted that the competent French and European organizations (ANSES, DGCCRF and EFAS) only consider the actual rate of free nicotine contained in the finished product according to the existing legislation. Advantages and disadvantages of salts compared to free nicotine. From a chemical point of view, they have some functional advantages over pure nicotine free base, mainly because they are more stable if they have been well formulated at the pH level. From an organoleptic point of view (which is likely to excite a sensory receptor), the differences are more important. Since they are closer to the chemical form present in tobacco leaves and because of a lower pH, nicotine salts provide greater sweetness in the throat. They also allow a faster passage in the blood and also have neither the unpleasant taste effect from the free nitrogen present in pure nicotine, nor the effect of bitterness related to an alkaline pH. The impact of nicotine is therefore higher and is done in softer sensory conditions. The historical fact that nicotine salts were originally used as "decoys" methods of dosing nicotine levels. Upon inhalation, the nicotine salt is converted to degrade partly free nicotine and acid (benzoic, levulinic or salicylic salt depending on the salt). If we know the toxicology of nicotine, we often think that the acids that are bound to it are neutral. This is not the case. Benzoic acid, although authorized as a food additive, is not an innocuous product. Consumed regularly or in high doses, it is responsible for coughing and nausea that can lead to anaphylactic shock. It is currently the subject of studies led by the European Commission to verify the absence of carcinogenic / mutagenic effect or reaction with certain food additives that could lead to toxic derivatives. It could also be added to the list of reportable allergens. Salicylic acid is a precursor of acetyl salicylic acid (the active ingredient of aspirin, derived from willow). It is authorized as a food additive as a preservative and antiseptic, but it is also used in cosmetics as an anti-dandruff, anti-acne and denaturant agent but limited to 3% in the finished product, and prohibited for products intended for children as it is considered irritating and allergenic. It is a relatively neutral acid, used in the plastics and rubber industry, as well as a photo-sensitizer. But it is mainly used in the tobacco industry because it seems to significantly increase the uptake of nicotine receptors up to + 30% according to the bibliographic references, because of a higher chemical affinity. (Lippiello PM, Fernandes K (1989, Sep 25 "Enhancement of nicotine binding to nicotinic receptors by nicotine levulinate an levulinic acid", BN 508295794, RJR). Quality of commercial nicotine salts. If we refer to our laboratory experiments (www.laboratoire-signatures.eu), less than 20% of the products studied have nicotine levels consistent with their labeling (the same is true of the PG / VG ratio). 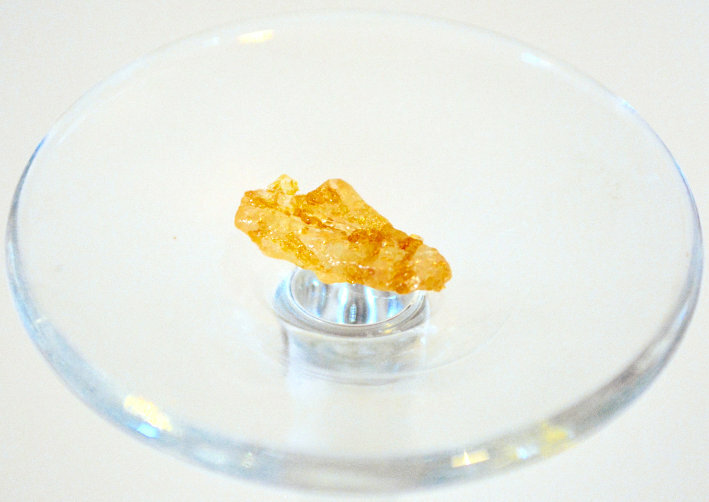 The free nicotine levels, which should theoretically be almost identical, regardless of the crystallization process used, actually vary between 10 and 50%. Given these approximations, both for the health of consumers who might be exposed to inadequate doses of free nicotine, and for distributors and manufacturers who might have their products withdrawn from the market for lack of labeling or for consumer danger, it is therefore imperative for formulators of e-liquid to ensure the actual composition of nicotine salts they use. To do this, it is necessary for them to demand from their suppliers the control bulletins issued by approved laboratories, then to check the dosage of the finished product, before integrating it into their formulations. It is therefore the optimal control of the entire production chain that will guarantee a compliant product, consistent labeling and greater transparency. This scientific article is taken from the third issue of The Vape of the Carrot (FEBRUARY 2019) belonging to Vapelier OLF Any reproduction, total or partial, of this article or of one or more of its components, by any means whatsoever, without the express authorization of Vapelier OLF, is prohibited. Pingback: DOSSIER: What about the beginner on e-liquids with nicotine salts.